As many of you know by now, my husband is in law enforcement. He’s been through some things that others want to hear about at conferences and classes, so he tends to travel pretty often as a speaker. 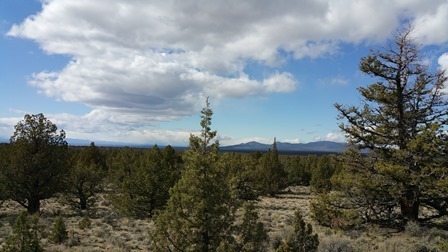 Sometimes I get to tag along, like on a recent trip to Bend, Oregon. We’re from northwestern Oregon, so the eastern side of the state looks like foreign land to us. It’s very flat and the trees are small, but it definitely has it’s own beauty. Without all of the other stuff in the way, the mountains are very visible and the significantly better weather is a welcome change. We’re giving it serious thought as a retirement destination. But I haven’t even mentioned one of the best parts of Central Oregon yet – the numerous fabric shops! I knew I’d have an entire day to myself during this trip, so before I left home I did some research and planned a route that took me to three different shops. I know three in a whole day doesn’t sound like much, but I’m realistic about my ability to spend a LOT of time looking at fabric. I ended up adding a couple more on the way back to Boring, for a total of five shops. Here’s the scoop. In true Central Oregon fashion, this sign was the first thing I noticed when I pulled into the parking lot at QuiltWorks. Personally, I think this is smart. No complaints from the husbands having to wait around in the fabric store! They don’t know what they’re missing though. QuiltWorks is one of the cutest shops I’ve ever been in. I was greeted by a lovely woman whose name (I hope I got this right!) was Kathy. She talked about how long the shop had been there, and the fact that their specialty is fat quarters. Her parents live near me and she travels through my area regularly. Small world. She was very friendly, and referred to me by my name the whole time I was there. She also talked about the other quilt shops in the area, and mentioned that they all refer each other regularly. It’s clearly a strong community rather than a competition, which was nice to hear. They have a great selection of fabric and patterns. 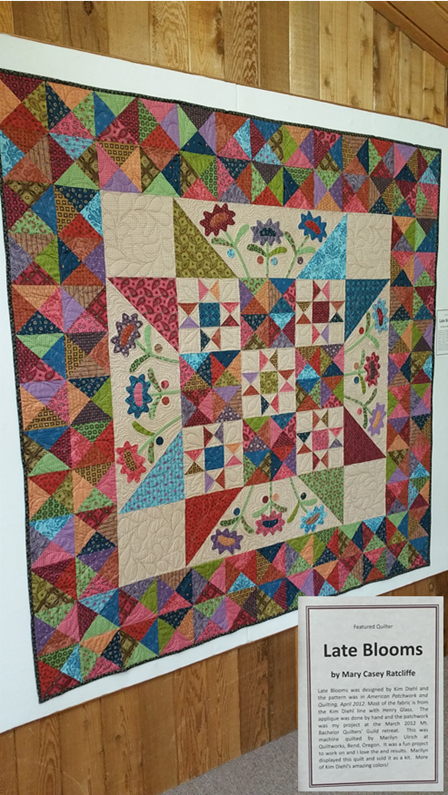 Like any good quilt shop, there are quilts on display everywhere, but if you ever find yourself at QuiltWorks, do NOT miss the gallery upstairs. It’s stunning. 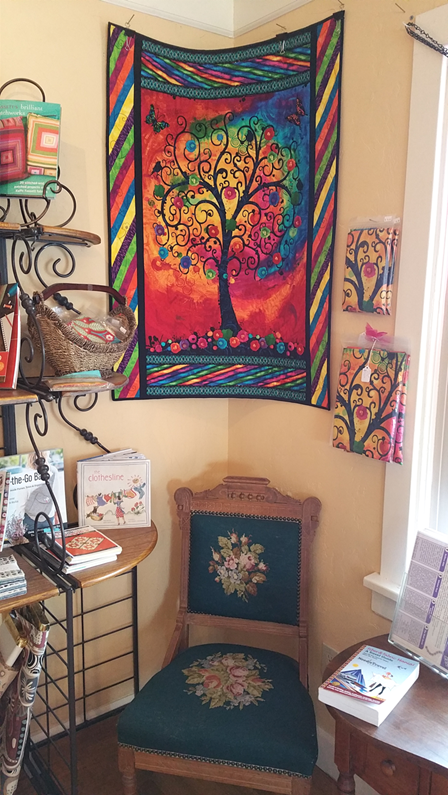 On one side of the room, you’ll find quilts by a featured designer, which changes monthly. During my visit, the quilts were made by Mary Casey Ratcliffe. On the other side of the room are quilts made by guild members. It seemed there were a couple of different groups that meet there. One of the things I found fascinating was a book club that partners with the local library. They read a book chosen by the library, then make a quilt inspired by the book. And these were definitely not beginner quilts. (Sorry for the blurry photos, but you have to see this) The book these quilts were based on is The Night Circus by Erin Morgenstern. Just, wow. My next stop was Sew Many Quilts. This was one of those stores where you think you’ve seen everything, then turn a corner and there’s more. I spoke very briefly with someone after I’d been in the store for a while, then wandered around. I liked the way some of the displays were grouped, with a quilt and the fabrics needed to make it together. They had a broad selection of seasonal prints available. When you sew, and especially quilt, you know that sometimes you need a good Christmas print in March. I didn’t end up buying anything at this stop. I had a bolt of fabric at the cutting table, but I’m pretty sure they wouldn’t have approved of me cutting it myself, and there was no one else around to do it. They seemed to be very busy talking about moving some things around, so maybe it was an off day. This was a fun shop, and the ladies working there were great. It was fun to walk around the store and hear them interacting with their customers. The vibe here was a little brighter and bolder than some small fabric shops. They have a great selection of novelty prints, always a favorite of mine. One of the things I loved about this store was the way they directed you to the patterns that were used for a display. For each item, there was a letter showing which section you’d find that pattern in so you didn’t have to search the store for it. See the H on the lower right corner of this quilt? Just below it is the J pattern and book section. Brilliant! When I went to the cutting counter to get some of this to take home with me…. …I noticed the awesome tool she used to cut it with. It’s a ruler with a sliding rotary cutter attached, and all I could think was “I need that!” They were nice enough to let me step behind the counter and try it out, and went to retrieve one for me from a recently delivered shipment. It’s my new favorite tool for cutting the ties for my vendor aprons. BJ’s will definitely see me again next time I’m in Bend. 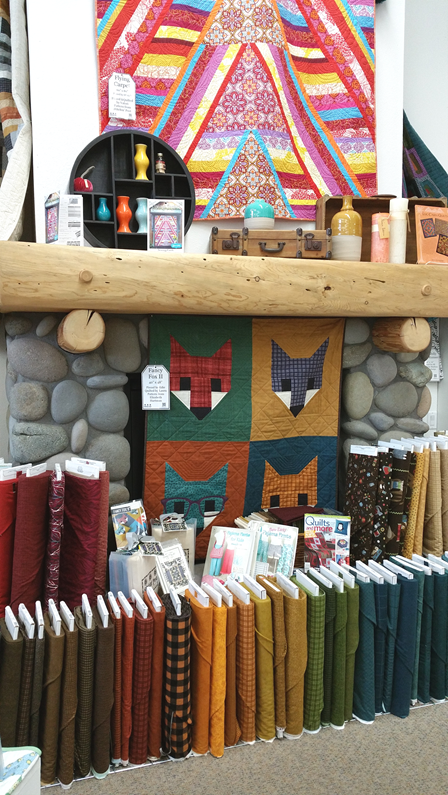 If you’re a sewist in Oregon, you’ve most likely heard of this shop in Sisters. They host the annual Sisters Outdoor Quilt Show, which attracts admirers from around the country. I haven’t been lucky enough to attend yet, but a visit to the shop will hold me over for a little while. Even the outside is pretty. This shop is owned by the mother-daughter team of Jean and Valori Wells. I won’t get into who they are in this already long post, but they’re well known in the fabric and quilting world. The inside of their shop does not disappoint. 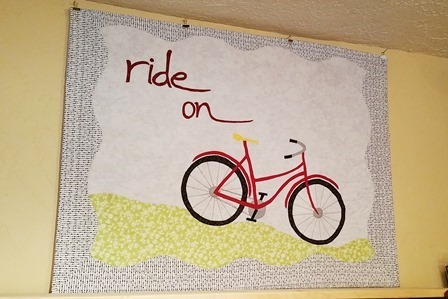 How many fabric shops are giving away a bike covered in the owner’s current fabric print? This is how deeply my husband is immersed in the sewing world. He went to the back of the store to find the restroom, and texted a photo of this quilt to me on his way back. In the meantime, this gorgeous piece caught my eye. This shop definitely reminds you you’re in Oregon. I’m a little low on yellow in my stash, so this piece came home with me. The woman who cut it owns a nursery in the town I live in. Told you, small world. This shop was our last stop on the way home. Kathy at QuiltWorks recommended I visit when we passed through Redmond, and that was good enough for me. We parked out front, turned around and realized it was across the street from the florist shop (where my friend’s sister works) that did my daughter’s wedding flowers! To fully appreciate how weird all these coincidental meetings are, you have to know this area is a good three hour drive from where I live. This shop is inviting from the outside. We had a good talk with the owner, and enjoyed walking through her shop. It was another that held far more than you’d guess. There’s a little play area under the stairs that’s both adorable and genius. For once, you might have to drag the kids out of the fabric store. There was a good variety in the types of quilts displayed at Material Girl, which I always find even more inspiring. 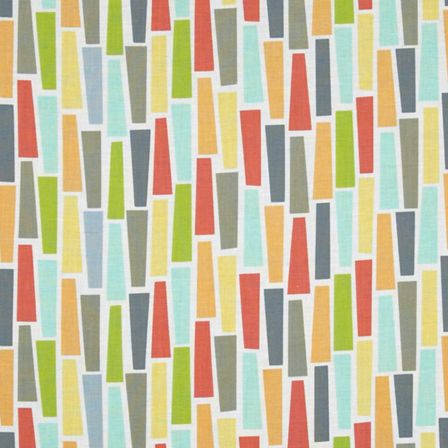 It makes me want to try new techniques and think about fabrics I wouldn’t ordinarily choose. We still had a long drive ahead, so we had to leave, but not before I grabbed a new black and white for my collection. If you need a good excuse to go visit all these amazing shops yourself, it just so happens that there are a couple of events coming up soon. 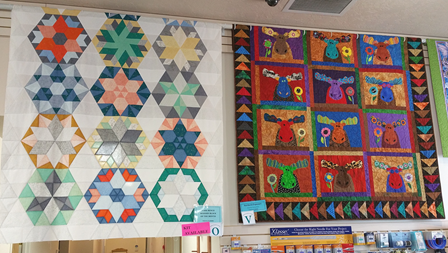 The Central Oregon Quilt Shop Hop, which includes all five of these shops plus three I didn’t visit, happens April 28 – May 1, 2016 and the Sisters Outdoor Quilt Show is July 9th. Kathy at QuiltWorks gave me this guide, which I’d recommend picking up at the first shop you visit. It has a map on the back. Next time I’ll definitely be hitting all eight, but I’m gonna need a week or so – and a big fabric budget!